I always design custom quilting motifs for my quilts that are an extension of the applique design. So off the shelf stencils and copying Dover designs have never really worked for me. Messing around with inaccurate and shifting tear away (or melting) stabilizer didn’t work for the intricate stuff and was a pain in the….well……backside. I tried making them with that plastic template material and the X-acto knife but that was always an adventure in frustration and too much work. Hmmmm, so how can I mark my quilt efficiently and use my own designs? The epiphany hit when I looked over and saw my roll of freezer paper I use for my applique templates. I can’t always see my quilting pattern under a light table and lining up and securing the quilt top over it so the top doesn’t move around is an exercise in futility. What if I traced the design onto freezer paper and then cut it out, ironed it on the quilt top positioned exactly where it should be, traced around it and easily removed it afterwards? Ha! it worked. I have no idea if someone else had been doing this and it is common knowledge, (I tend to live in my own little bubble sometimes), but the idea makes my quilting life a whole lot easier and gives me more options when designing quilting designs for my quilt. Pretty much anything is do-able and easily marked. The next step after the stencil is properly placed and securely ironed, is to mark around it with your preferred marker. Mine is the blue marker that comes out in the wash. Remove the stencil and voila! All ready to be quilted. This has just been sewn for Trapunto so it looks a bit icky (technical term) right now. 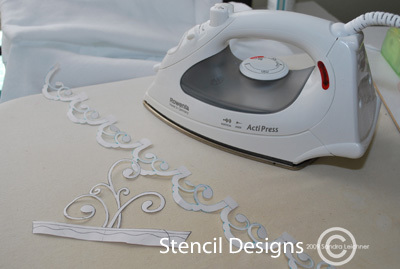 I thought I would share this tip with anyone else who lives in their own little bubble and was unaware of the magical uses of freezer paper for making quilting stencils. all content ©2009 Sandra Leichner all rights reserved. Sandra, you’re a genius! I have used this trick before, but never with something so intricate and not for a quilting design like you just demonstrated. Thanks for sharing such a valuable tip! (I’m usually off in my own little bubble, too!) I absolutely love your work, by the way . . . . I don’t know what bubble I’m in, but beingwith you , in your bubble sure is fun ! Ummm, why didn’t I think of that! I think working in your own little bubble you tend to try things because noone is there to tell you how to do it, so you work it out. Sometimes it takes a while …..
Forgot to say, I will use this for hand quilting as well. And must tremember to stock up with freezer paper next time I find some …. it is not available in Australia, but we do have Gladbake, which works like an applique mat! Now I am envious of your Gladbake! What possibilities.